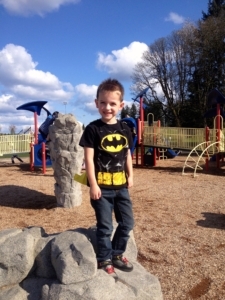 Gregory Coulthard is a 6-year-old who has lots of personality and is outgoing. He will be entering 1st grade this year. His favorite subject like most kids is age is recess because he loves to run and play with his friends. He is working hard learning to read and his said he is very good at Math. When he isn’t at school he is training in Karate to become a ninja. Gregory was born on September 19, 2009. He spent his first 3 days in the NICU, where he experienced limbs bluing and feeding issues. The medical team felt that it was just an immature nervous system, and the issues would resolve. Some of the struggles we have experienced in his short life area: he cried non-stop for the first year of his life, we struggled with feeding, silent reflux, at one year of age he stopped eating, studies have shown delayed motility in the stomach and small intestine leading to a diagnose of Gastorparesis, Oral Dysphasia, speech delay, Hypotonia, left side weakness, Ptosis, generalized trunk weakness, Central Cyanosis, Failure to thrive hypoventilation, Dysautonomia, Respiratory Sinus Arrythmia, Pulmonary Stenosis (resolved), Cardiomyopathy and a Clinical diagnosis of Mitochondrial disease. At one year Gregory had a Nissen and g-tube placed. Doctors believed that the cyanosis was due to reflux. There was no change after surgery and infact worsened as he was bluing with activity, stumbling and had changes in his speech. He uses Oxygen continuously at night due Hypoventilation and as needed for cyanosis during the day. The cause of the Cyanosis is unknown. Gregory’s older brother has similar symptoms leading Doctors to believe their condition is genetic. In 2011, our doctors started looking into Mitochondrial Disease after other conditions had been ruled out. Our Geneticist at the time gave Gregory a Mitochondrial Disease diagnosis. Gregory’s health is currently stable, and we are thankful for that every day. To help him remain stable he requires multiple medications, G and J feeds, Cpap at night, temperature monitoring, extra fluids and intermittent oxygen usage. Those are just a few of the daily parts of our routine that help to keep him stable, that’s not to say that his health is the same as any other child his age. Gregory knows and is beginning to realize that while he is a six-year-old little boy that he is different then his peers. He knows that he has a tube in his tummy, and they don’t, he also wears a cooling vest, and they don’t and he uses cpap and/or oxygen and they don’t either. Instead of getting focused on his differences we try and help him see that he is just like them, he just needs a little extra they don’t. But he can do anything they can as long as he has the drive and determination. He might just take longer or have to find a different way to achieve it, but he will. In 2012, our family relocated, and Gregory began care under Dr. Saneto. I can honestly say that we were really scared to make changes to the medical care we had in place for Gregory, but it has been a wonderful experience. The Guild has been very welcoming and for the first time every we have a group of people who can understand. The group offers support and education to families about Mitochondrial Disease.